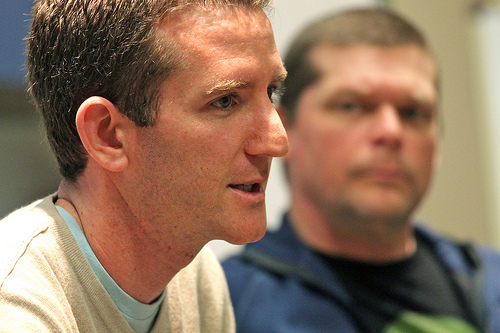 The talk with @livestrongCEO Doug Ulman @sxsw was a highlight of the past week. I was on the road talking Twitter, bike culture, changing the world with bikes, and web design at 4 different events. Doug told us how Livestrong started as a bike ride – the Ride for the Roses. After some rest over the weekend and bike rides, it’s back to work on a new event with Webvisions in Portland. It’ll have big ideas, thinking, and bikes. Doug Ulman and Byron photo uploaded by Mathowie.